Recently while going through some old family items, my wife came across a 1956 issue of Argosy magazine. Now, you've got to be near or beyond retirement age to even remember Argosy so, if you're younger than that, it was a popular mens' magazine that began publication in 1882. It finally went the way of the Dodo bird in 1978. If you do a little research on it, you'll find that over the years the magazine has had some well-known writer's stories. Horatio Alger, Upton Sinclair, Zane Grey and Edgar Rice Burroughs are among the more notable contributors. What piqued my interest as I flipped through the aging pages wasn't the stories of Russian cold war defectors or the dangers of hunting wild water buffalo in Brazil. The thing that got my attention were the ads for outdoor gear. Mitchell Model 300 spinning reels with extra spool, a new fangled fiberglass rod, rod sack and aluminum tube for only $34.70. If you didn't have $34.70 to spare, just send them $2.00 as a down payment and take 6 months to pay the balance. Stevens Model 77 pump shotguns at $49.95. Genuine Paratrooper Boots for $14.87, postpaid in the U.S.A. A Smith & Wesson .38 Revolver, WW II issue, for $24.95. And my favorite of all time, Shrunken Heads straight from the Amazon for only a buck fifty ppd. 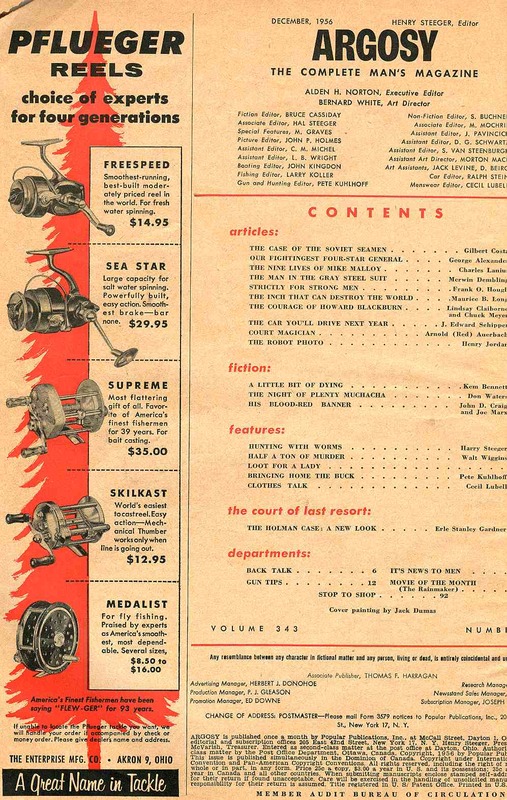 The best ad in the magazine that got every angler's attention, however, had to be the one for Pflueger Reels. The good old Medalist was selling for $8.50. In today's dollars, that translates to $70.82. I've always been enamored with the Medalist. The smooth hefty feel and that sound. Man, that solid "click, click, click" is as distinctive as the old two-cylinder "Poppin Johnny" John Deere tractor. Some things just conjure up images of the past and a Pflueger Medalist is one of them. I've got one of those Pflueger and your comments reminded me. Nothing like hearing that click, click when the fish took off. Speaking of Mitchell 300, remember that they used to come in a red hard plastic box with a clasp that held the extra spool, which had a smaller capacity to hold the smaller test line?